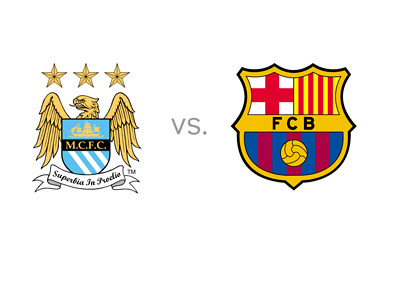 Manchester City will host Barcelona in the first leg of the UEFA Champions League round of 16 on Tuesday, February 18th, 2014. Manchester City most recently beat Chelsea 2-0 in the FA Cup, after losing to them 0-1 at home in the league the week before. Samir Nasri and Alvaro Negredo, who were out with injuries for some time, made a return to the lineup in the last game. They are most welcome back, as the team struggled in their absence. Stevan Jovetic, who has been out for most of the current season, started the last game, played well and scored a sweet goal. This is good news for City, as their star striker, Sergio Aguero, is still out with injury. Manchester City are very much in contention for four trophies this season and have, for the most part, been a powerhouse, especially at home. This is the club's first ever UEFA Champions League knockout stage and they earned it by finishing second in Group D, behind Bayern and ahead of Plzen and CSKA. Barcelona are in great form at the moment. They just trashed Rayo Vallecano 6-0 in the league. Mid-week, Barca earned their spot in the Copa del Rey final by eliminating Real Sociedad, while a few days earlier, they beat Sevilla 4-1 in the league. Messi scored two goals in the last game and Neymar added a last minute beauty. Barcelona are at the top of the Spanish La Liga tables, in the finals of the Spanish cup and they are coming out as the number one team from Group H, which also featured Milan, Ajax and Celtic. Messi is in form. Neymar is back. Even Puyol started the last game. Barcelona are playing well and looking good! According to the odds, Barcelona are the slight favourites to win at the Etihad, as well as to advance to the next round. For the sake of the game, many people must be wishing that Sergio Aguero was playing as well. Let's hope that he is in the return leg at Camp Nou on March 12th. It is good to have the Champions League back!